As applied to science and technique a creative problem is defined as stemming from the resolution of a contradiction. The concept of state space for the problem is introduced and the abstract model for the problem as an element of the state space is proposed. Then the solving consists in extension of the space dimension. The contradiction is resolved by separation of the required contradictory properties into different coordinates. We present examples from different science and technique fields (mathematics, physics, biology, medicine and communications). It is noted that the proposed concept can serve as the basis for developing of practical methodology for creative problems solving. The research focuses on university-industry technology transfer, which is becoming increasingly important. The research analyses factors affecting the certain case of university-industry cooperation. The factors are tested by adapting the Kano methodology, often used for determining consumer needs and quality assurance purposes. The research results show that although in most cases the respondents’ opinion on the importance of certain factors is not homogenous; nonetheless it indicates that the greatest importance should be paid to the factor defining the students’ abilities to absorb the skills. In the meantime, the accuracy of the stated outcomes can be considered as the most successful factor in this case. The research results may not be generalized due to the limitations in the tested aspects as well as the fact that it analyses a certain case study, but it can be used for complementary purposes in the context with other case studies. Planning the innovative products includes both a technical and commercial evaluation. Suppose, an organization is looking for a new product and has several alternatives that finish initial screening at the same time. Sometimes the organization will have enough resources to develop and market all of these innovations, but usually resources are limited and one product is being chosen above the others. So we need some simple methods to compare products and choose the best. There are several ways of comparing the products, one of this is Quality function deployment QFD and Break even point BEP method. The goal of this paper is commercial evaluation with Break even point method as method for comparing the products and QFD method usage on the theory and practice base. In the presented work investigated the changes of power characteristics of deep drilling package of printed circuit board’s hard metal micro drills depending on the drilling depth, cutting data and geometry of the drill. In particular studied the nature of changes in axial efforts and torque depending on the drilling depth drill with different inclinations of the spiral grooves using specially designed highly sensitive devices, enabling direct measurement method. Based on the analysis of the results of the study, changes in the geometry of existing standard drills. Proposed new construction of micro drills vary-angle spiral grooves in such a way that the angle is the maximum value at the top of the drill and uniformly decreases towards the end of the working parts. The drills are manufactured with different inclinations of the spiral grooves. Based on the experiments of them chosen more for its near standing power rates to the standard drill bit and its comparative test with a standard drill bit, bringing them up to the breakage, thanks to which the proven advantages of drills new design. Taking into account the results of the experiments proposed drill elongated structures to improve performance by increasing the processing drilling depth and accordingly the number of plates in the package of printed circuit boards. 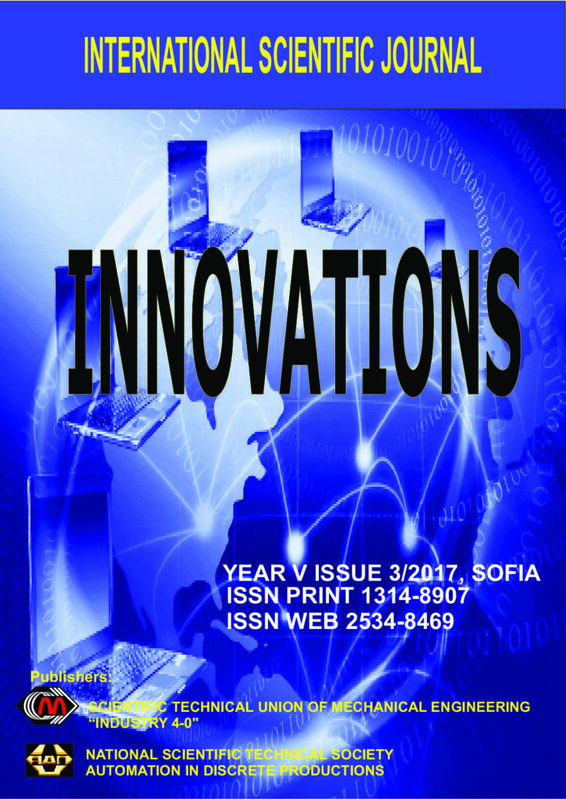 The paper summarizes studies pertaining to an innovative method of polymeric chips and sawdust boards production. RD boards are manufactured from post-production waste in the form of chips. The chips are heated and pressed under small pressure in metal forms. The product is characterized with good sound and thermal insulation, small mass, and low manufacturing cost. As a consequence, it can be applied in several types of products as a filler. Greening the building envelope is innovative technology in architecture that can regain losses of a natural environment in dense urban areas. Implementation of green living systems, greening horizontal surfaces with intensive and extensive green roofs or using vegetation in vertical greening systems for façades is a strategy that provides ecological, economic and social benefits and it is a sustainable solution for improving the environmental balance of cities limiting the major negative effects of urbanization providing better comfort at both building and urban level. The potential to provide external and internal sound insulation due to their high mass and absorption through the surface, reducing and control of noise pollution in urban areas, was investigated trough various studies. There are several situations in which noise reduction due to green living systems’ sound absorption should be considered important, such as buildings near to roads, rail or air traffic noise sources. The configurations of the systems, substrate thickness, and vegetation layer, are important factors affecting the sound absorption and sound propagation properties of these systems. This review paper presents findings from different research conditions and approaches, to explore the importance of green living systems considering the impact on noise mitigation and acoustic aesthetics of the environment. Diagnostic system is very important part of a system for fault prediction and it is very helpful tool to improve efficiency of industry production. If we want to attain an optimalisation of production, have shortest lead times, low costs of production we need accurate information from maximal number of criteria collected from production machines, to setup best process parameters focused on reaching acceptable life time of machine parts. For this reason, we need improve the power of diagnostic systems with implementation of new methods with new possibilities. Transmission of confidential messages over wireless networks between a transmitter and a receiver in the presence of illegitimate receivers called eavesdroppers is an active area of research. Cooperation by jamming can improve information-theoretic secrecy in wireless networks. However, randomly chosen jammers can have a negative impact on the secrecy capacity. Our goal is to provide a closed form for positioning the friendly jammers in two-dimensional wireless network with uniformly distributed eavesdroppers while two legitimate partners are communicating. This paper deals with the comparison of analysis of two legged humanoid robots during walking. This research area is characterized by the fact that there are a lots of publications, most of which are based on the classic Zero-Moment-Point (ZMP) method. First, a brief overview is provided on humanoid robots, and also models for the dynamic behavior are discussed. As base for these models these two methods Denavit Hartenberg and the Newton-Euler are used. Main aim of this work is to investigate the stability of humanoid robot developed. There is currently the low base of robot – consisting of feet, legs, hips and upper part of robots body. First, the existing low base of humanoid robot was simulated using Matlab / SimMechanics, where the derived by Newton-Euler model was used. The paper describes the methods for the design of systems for implementing intelligent control of transshipping processes at the seaport. Movement of cargo flows requires a constant solution of singular case transportation problems of operational planning and management. The paper shows how the obtained mathematical models of management of cargo flow movement processes, allow for solving optimization problems of the divergent options of bulk cargo movement within the Functioning of infrastructures within a seaport, as well as their communication with suppliers and consumers of loads within the transshipping complex. Modeling of different options bulk cargo movement is needed for providing the given intensity of ship loading taking into account various factors, including weather. The designed model allows for solving the scheduling problems the execution of works on cargo handling in the seaport terminals. The steam distillation is the most frequently method for production essential oil from fresh medicinal and aromatic plants. This paper compares an existing with an innovative solution of the substance flow system which is used for production essential oils from the biomass of lavender, juniper, immortelle, chamomile, etc. In order to improve the effectiveness of the distillation process as well as the quality of extracted essential oils, most often used substance flow system was reconstructed. The existing solution of distillation equipment was improved with two innovations. The first one refers to the supply of steam from upper side into the distillation unit, and the second is the technical solution of the condenser. The new distillation equipment was produced in domestic company, and analysis of produced essential oil from immortelle was compared with oil produced with classic distillation method. The analysis showed the improvement of the quality of the essential oil produced with new distillation unit.